With 1472 pages of gun prices, photos and descriptions, there's a pretty good chance you'll find what you're looking for. Thanks to everyone who commented for a chance to win the 2012 Standard Catalog of Firearms. We thought we’d chosen a relatively obscure gun for the contest, but many astute readers guessed the model right anyway. The price? Exc 19000, VG 14500, Good 7500, Fair 3500, Poor 2500. Note: With stock add 50 percent. The winner of the book this week, by random drawing, is “rud.jordan,” one of the many readers who got the model correct, and he was also right in the ballpark with his guess on the value. Thanks again to everyone who entered the book giveaway, and to all of you for reading the blog. If you didn’t win, but would like a copy of the Standard Catalog, click here to get yours in the Gun Digest Store. 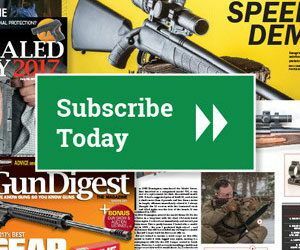 As a valued Inside Gun Digest Books blog reader, get free Standard U.S. shipping by using promo code INSIDEGDB. Fine print: This offer is valid with the purchase of 2012 Standard Catalog of Firearms. Items which ship directly from the manufacturer, indicated by a little red truck symbol, do not qualify for free shipping. And, remember to check back often for more chances to win great Gun Digest books!